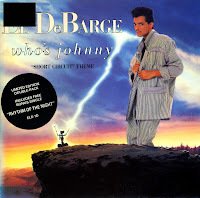 El Debarge was born on June 4, 1961. He was the lead singer of the band Debarge, which scored their biggest hit in 1985 with the UK number 4 hit 'Rhythm of the night'. After this success, El left the group to start a solo career. His first break came in 1986 when he was asked to perform a song for the soundtrack of the movie 'Short circuit': 'Who's Johnny'. Although this single only made number 60 in the UK singles chart, it reached number 3 in the Dutch Top 40 and the US Billboard Hot 100. This double single features the two hitsingles: 'Who's Johnny' and 'Rhythm of the night'. One of those delicious double singles. A great buy!